Barbie outfit 1970 #1456 Dreamy Blues, perfect. Barbie outfit 1970 MOD #1160 TNT doll knit swimsuit, excellent condition. Barbie outfit 1971 #3409 Red for Rain, fabric like new. Barbie outfit 1971 #3416 Wild n Wintery, some play signs, no noticeable flaws. Barbie outfit 1971 #3417 Bridal Brocade, with htf bouquet and shoes, not as new, but very minor wear. Barbie outfit 1971 #3419 Silver Serenade, some play signs, excellent. Barbie outfit 1971 #3424 In Blooms, perfect. Barbie outfit 1971 #3426 Turtle ’n Tights, has seam repair on back, closure skirt needs one stitch. Barbie outfit 1971 #3427 The Dream Team, from play lot, flawless. Barbie outfit 1971 #3434 Fun Fur, very minor playwear, complete. Barbie outfit 1971 #3492 Flying Colors,very minor playwear, complete, with necklace, vhtf . Barbie outfit 1971 Walking Steffie jumpsuit, perfect. Barbie outfit 1972 #3339 Light n Lazy, with undies, htf. Barbie outfit 1972 #3340 Golden Glitter. from play lot, minor play signs, three buttons, lace and elastics intact, with htf purse. Barbie outfit 1972 #3351 Good Sports, jeans, top and scarf, hardly any play signs. Barbie outfit 1972 #3354 Glowin Gold, from play lot, gently played with, nice. Barbie outfit 1972 #3358 Lovely n Lavender, perfect. Barbie outfit 1972 #3359 Pants Perfect People, seam has some weaker points, in general excellent condition, with htf purse and fluffy black pumps. Barbie outfit 1972 #3360 Pleasantly Peasantry, with htf belt, shoes underskirt, perfect. Barbie outfit 1972 #3360 Pleasantly Peasantry underskirt, could be refreshened, nice. Barbie outfit 1972 #3490 Party Lines dress, from play lot, has a darker spot on ruffles (see pic), otherwise looks nice, htf. Barbie outfit 1972 Sweet Sixteen doll bonus outfit. Barbie outfit 1973 #3203 polka dot vest. Barbie outfit 1973 #3205 Gingham ’n Lace, elastics intact, excellent condition. Barbie outfit 1973 #3208, from play lot, but very minor playwear, excellent. Barbie outfit 1973 #3347 flowered mini dress, with htf belt and socks, white collars bit off-white not mint, otherwise excellent. Barbie outfit 1973 #3348 Yellow Baby doll set, some playwear. Barbie outfit 1973 #7700 Doctor Get Ups n Go, near complete, white coat some tiny yellowed spots, will wash out easily. Barbie outfit 1973 #7701 Ballerina, guag, complete, some play wear, but very minor. Barbie outfit 1973 #7703 Airline, five complete pieces, excellent condition, one shoe. 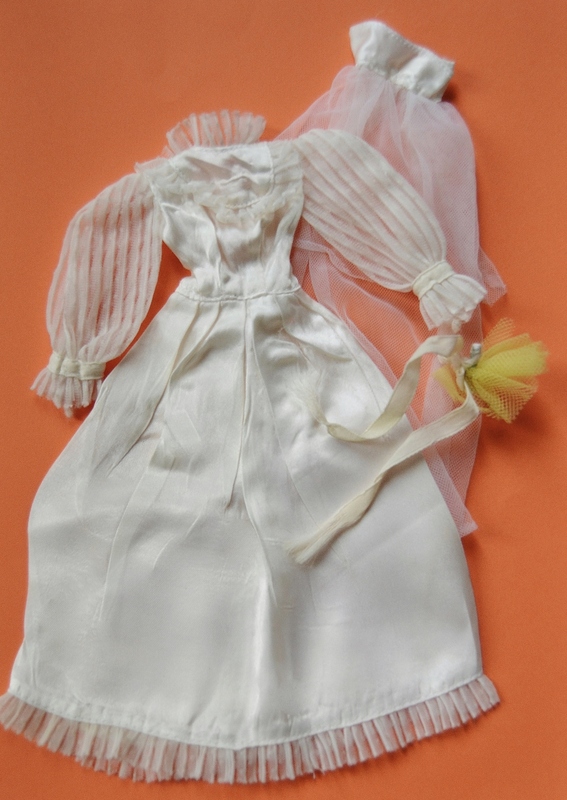 Barbie outfit 1973 #8622 Jumpsuit, white lace overblouse, from play lot, still nice, no noticeable flaws. Barbie outfit 1973 #8681 red sweater, htf. Barbie outfit 1973 #8689 Cocktail Party, blue variation. excellent, no flaws. Barbie outfit 1973 #8691, with replacement flower decoration. Barbie outfit 1973 8690 Nice for bed, looks new. Barbie outfit 1973 Quick Curl doll. Barbie outfit 1973# 8692 blue satin dress, with flower decoration, flawless. Barbie outfit 1974 #7752 Blue suit, very minor play wear. Barbie outfit 1974 #7756 Pepsi outfit, complete with htf visor, bottle and hamburger. Barbie outfit 1974 #7757 red maxi dress, from play lot, some signs of age. Barbie outfit 1974 #7787 Ski Get Ups n Go. Barbie outfit 1974 #7814 salmon dress, with flower decoration, elastics intact. Barbie outfit 1974 #7821 red & beige checked, could benefit from gentle washing, nothing serious. Barbie outfit 1974 #7822 jeans and rain hat, excellent both. Barbie outfit 1974 #7840, not for mint collectors, some play signs, missing the right ribbon and some weaker seams, which should be looked after, with vhtf purse. Barbie outfit 1974 #7841 GUAG Dreamy Designs For Dressy Dinners, flawless. 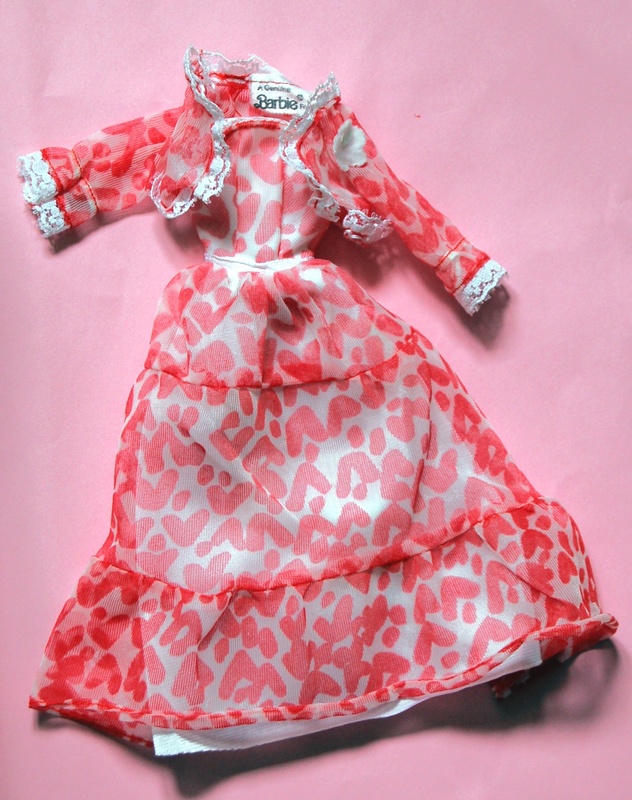 Barbie outfit 1974 #7843, salmon party dress with matching jacket and boa, some playwear, loose threads and weaker spots in the orange fabric. Barbie outfit 1974 #9049 Sears original, no flaws, vhtf. Barbie outfit 1974 #7754 Pink sleep set. 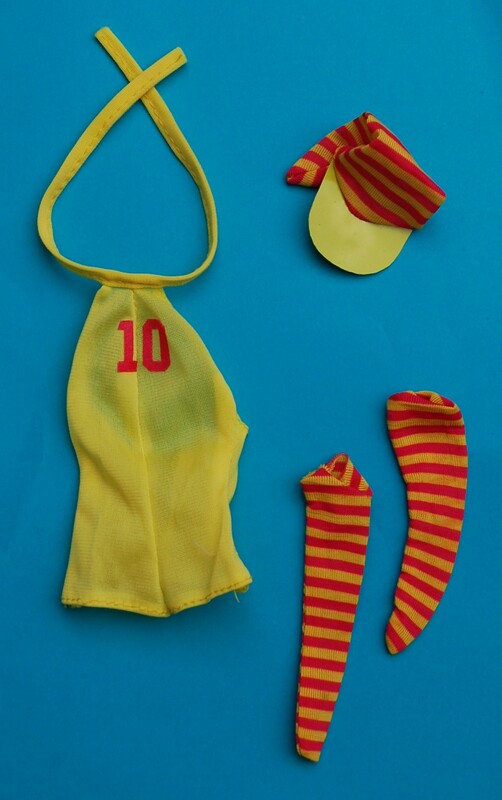 Barbie outfit 1974 Free Moving PJ doll, with sports accessories. Barbie outfit 1974 Newport doll, some playwear. Barbie 1974 swimsuit #8587 Standard doll, perfect. Barbie outfit 1974 Yellowstone Kelley original outfit, minor playwear, not mint. Barbie outfit 1975 #2218 Calico dress Best Buy. Barbie outfit 1975 #7241 Bright n Gay for Holiday Play complete, as new condition. Barbie outfit 1975 #7242 Busy Get Going, perfect condition. Barbie outfit 1975 #7244 Olympics Set Get Ups N Go, with htf purse, excellent. Barbie outfit 1975 #7422 red skirt. Barbie outfit 1975 PJ Olympic Gymnast jacket. htf. Barbie outfit 1976 #9163 lingerie, find the blue bra and you will have this htf outfit complete., from play lot, elastics stretched out. Barbie outfit 1976 #9326 Sugar Plum Fairy, complete, hardly any playwear. Barbie outfit 1976 #9327 Snowflake Fairy, with hair piece and stick, excellent. Barbie outfit 1976 #9419 Fashion Originals or Beautiful Bride, excellent. Barbie 1976 #9422 satin peach dress, with htf scarf and purse. Excellent. Barbie outfit 1976 #9577, pink party dress, perfect. Barbie outfit 1976 #9578, with htf purse. Barbie outfit 1976 #9740 Brocade Dream dress. Barbie outfit 1976 #9740 Brocade Dream Steals the Scene, one shoe strap has been glued, otherwise excellent outfit, with htf microphone. Barbie 1976 #9824 Satin ’n Shine shirt. Barbie outfit 1976 #9160, with red scarf, htf. Barbie outfit 1976 #9582 halter dress, some weaker spots in the satin lining, otherwise crisp, closure intact. Barbie outfit 1977 #9818 Fashion Originals South o the Border, as new condition. Barbie outfit 1976 #9959 Sun Suit, perfect. Barbie outfit 1977 #9624 silver and pink party suit, flawless. Barbie outfit 1977 #9626 blue chiffon dress, excellent. Barbie outfit 1977 #9628 with purse, some playwear, htf. Barbie outfit 1977 #9629 70s ensemble of dress, vest and hat, some playwear, excellent. Barbie outfit 1977 #9738 Pink and White Lights the Night, get ups 'n go, from play lot, but excellent. Barbie outfit 1977 #9739 Red Shine for Rain Time, excellent. Barbie outfit 1976 #9817 Osmond, Deepest Purple. Barbie outfit 1977 #9965 'Florida', excellent, complete, htf. Barbie outfit 1977 #9621 Clouds and rainbows, excellent. Barbie outfit 1977 #9625 jumpsuit (matching baret for sale in accessory department). Barbie outfit 1977 #9819 Marie Osmond Silver Shimmer, with htf umbrella. Barbie outfit 1977 #9966 pink jumpsuit halter, complete, excellent. Barbie outfit 1977 Fashion Photo bodysit, with some wear. Barbie outfit 1978 #2226 yellow peasant dress, red vest. Barbie outfit 1978 #2228 Pinwheels, complete, excellent, elastics skirt intact. Barbie outfit 1978 #2228 red white peasant dress and scarf, some play wear. Barbie outfit 1978 #2252 Soft and Shimmering Silver and White, tlc, seams need repaired. Barbie outfit 1978 #2302 Gets up n go Flowery delight, no playwear, complete. Barbie outfit 1978 #2303 Lady in blue, lavender variation, perfect. Barbie outfit 1978 #2480 Sunny Yellow Shine for Nighttime, excellent sheer, not new, turban hat misses seguins, vhtf necklace is included. Barbie outfit 1978 #2550 aqua and gold 2 piece. Barbie outfit 1978 #2561 black peasant dress, some wear. Barbie outfit 1978 #2784 long blue dress, white lace top. Barbie outfit 1979 #2790 Designer Original In the Limelight, excellent, vhtf. Barbie outfit 1978 2481 Dramatic Blue and Silver Aglitter, silver jumpsuit, excellent. Barbie outfit 1978 #2482 Bright Bedazzling Charmer, skirt lost its stretch, otherwise excellent, with minor wear. Barbie outfit 1978 #2552 red dress with black lace vest, ribbons have signs of age, otherwise excellent. Barbie outfit 1978 Superstar Pretty Changes doll, one popper missing on jumpsuit, jumpsuit needs washed. Barbie outfit 1978 Superstar promotional issue, some playwear (loose threads on the dress), excellent. Barbie outfit 1979 #2668 Designer Originals The Royal Ball. Designer Originals, with playwear, couple of tiny holes in the cape, not noticeable on display..
Barbie outfit 1979 #2671 City Sophisticate. Barbie outfit 1979 #2781 red skirt and blouse. Barbie outfit 1979 #2788 Rain or Shine trench coat, with purse. Barbie outfit 1979 #2789 Designer Originals Velvet Touch, from play lot, but with hardly any play signs. Barbie outfit 1979 #2790 Designer Originals In the Limelight or Casino, with htf shoes, excellent. Barbie outfit 1979 #2785 Summer Romance, htf. Barbie outfit 1979 Kissing Superstar doll, perfect. Barbie outfit 1980 #1414 Evening Elegance Designer Originals, like nw. Barbie outfit 1980 #1957 Designer Originals Golden Accent, unplayed with. Barbie outfit 1980 parts Western Superstar doll. Barbie outfit Francie outfit 1973 #8644 Red, white and blue halter dress. Francie outfit 1971 Frosty Fur #3455, excellent. Francie outfit 1972 #3278 Checker Chums, crisp fabric. Francie outfit 1972 #3275 Little Knits, perfect, one sock (slippers for sale in shoe department). Francie outfit 1972 #3279 Totally Terrific, from play lot, minor play signs, seam repair in the red bodice. vhtf. Francie outfit 1972 #3281 Cool Coveralls, with backpack and boots, some wear. Francie outfit 1972 #3283 Francie Suited for Shorts, very minor play wear. Francie outfit 1972 #3364 Sleepy Time gal, with slippers, elastics lost stretch over time, otherwise excellent. Francie outfit 1972 #3446 Midi Bouquet, perfect condition, with htf shoes. Francie outfit 1973 8649 Hubsch Kombiniert, as new.